A suspension of flour in water is a heterogeneous mixture. In chemistry, a mixture is a material made by combining two or more different chemical substances (such as chemical elements and chemical compounds) in such a way that the components do not form chemical bonds to one another and do not chemically react with one another. The components can usually be separated from one another by a mechanical or physical process. Some examples of mixtures are oil, ocean water, and soil. Mixtures may be classified as homogeneous mixtures, heterogeneous mixtures, and colloidal dispersions. A mixture is said to be homogeneous if it has a definite composition and properties. The particles in the mixture are uniformly spread, so that any amount of the mixture has the same composition and properties. Examples are solutions and some (but not all) alloys. A homogeneous mixture is a uniform mixture consisting of only one phase. Examples are gasoline and margarine. A solution is a homogeneous mixture of one or more substances (the solutes) dissolved in another substance (the solvent). Solutions have all particles within the size of atoms, small molecules, or small ions, less than one nanometer (nm) in all dimensions. A common example is a solid dissolved into a liquid, such as salt or sugar dissolved in water, or gold into mercury. Liquids dissolve into one another, and sometimes liquids dissolve into gases, for example water vapor and the atmosphere. Common examples include soft drinks, where carbon dioxide is trapped in the liquid through carbonation. Several solution properties collectively called colligative properties change as a function of solute concentration. Solubility is a compound property. A homogeneous mixture in which the particles of one or more components have at least one dimension in the range of one to 1000 nm, larger than those in a solution but smaller than those in a suspension. In general, a colloid or colloidal dispersion is a material with components of one or two phases, a type of mixture intermediate between a homogeneous mixture and a heterogeneous mixture, with properties also intermediate between the two. A colloid will not settle if left to sit. Examples of this are jelly and glue. Heterogeneous mixtures are mixtures with indefinite composition, such as granite. Heterogeneous mixtures are said to have several phases (not to be confused with phases of matter). The parts of a heterogeneous composition can be mechanically separated from each other. Examples include salad and trail mixes. A heterogeneous mixture in which the particles of at least one component are larger than one micrometer (μm, 1000 nm) in at least one dimension, larger than colloidal particles. Unlike colloids, suspensions will eventually settle. 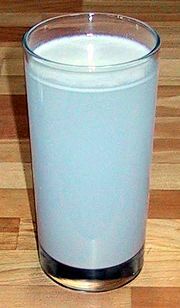 An example of a suspension is sand in water. Particles of suspensions exhibit the Tyndall effect, that is, they are large enough to disperse light, like colloids. ↑ P. W. Atkins and Julio De Paula, Atkins' Physical chemistry, 7th Edition (New York: Oxford University Press, 2002, ISBN 0198792859). ↑ 2.0 2.1 2.2 James E Brady, and Frederick Senese, Chemistry: matter and its changes, 4th edition (NJ: Wiley, 2004, ISBN 0471215171). This page was last modified on 11 October 2018, at 15:55.